I received my first order with Paula's Choice the other day. I got a $10 off coupon that I found online plus they had free shipping, so I figured I didn't have much to lose- the $26 skin product I wanted to purchase only ended up costing me $16! I did have to pay a $5 customs/brokerage fee and tax however, but it was still a deal! 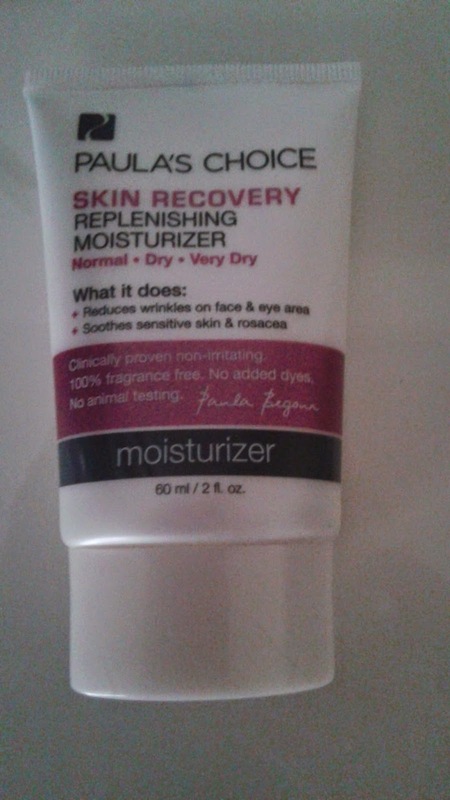 I ordered the Skin Recovery Replenishing Moisturizer ($26 reg) and a nice size at 60ml! The other items are samples and some skin care booklets that all came free with my order. When you checkout on the website you are able to add 3 free skin care samples of your choice. I'm excited to read the free skin care booklets too, since I'm a total skin care junkie! I used the Recovery Moisturizer last night with my Holistic Vanity Argan oil (from Pure and Simple Spa) over top and Pure and Simple's Algae Serum underneath. My skin stayed hydrated until I woke up... I couldn't stop touching my skin! Even with the Argan oil, a lot of my other moisturizers fail to keep my skin moisturized through the night, Paula's Skin Recovery Moisturizer did not disappoint. This morning I used the Skin Recovery Moisturizer again, this time just over a serum, and without an oil over top. It left the perfect finish to my skin, it looked and felt moisturized, but sunk right in and did not leave any greasy residue. It also left the perfect finish (almost like I had used a primer) for application of my daily BB cream (currently that is the Physicians Formula Super BB), Usually when I apply this BB cream my skin looks dry underneath, despite my previous moisturizers layered underneath. It's currently past 5pm and I cannot stop touching my face! And it looks GREAT for a change! So I am excited to say the least, I love me some good skin care. I don't want to get too ahead of myself because I am very acne prone, but *knock on wood, so far so good, I don't see any signs of clogged pores, nor does it feel clogging, and the few spots I have from other skin care samples I tried still seem to be clearing up! ps. if you are interested, I encourage you to sign up with them as they will send you info on sales as well as coupons for your Birthday etc..
(note: this is an affiliate link and we will both benefit if you use it. After signing up you can also get a $10 off coupon code to share with your friends and family).